This Credential of Ministry acts as your ministry license. Printed on beautiful 8.5x11 inch paper perfect to frame, display, or to present when officiating. 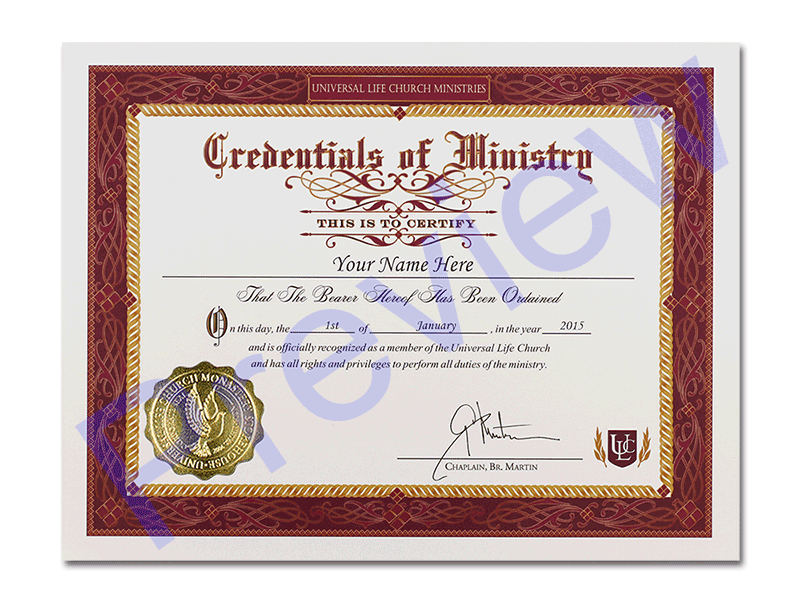 The most important ministerial document to acquire, this Credential of Ministry acts as your legal ministry license. If you are asked to provide legal documentation to a clerk or a couple prior to performing a ceremony this is what you will need to show them. It is the most commonly required item for a minister looking to perform a wedding ceremony and we recommend everyone who plans to perform a wedding have an original on hand for their record. It is custom printed with your name and ordination date and features the gold embossed church seal, and signature of the Universal Life Church Chaplain. The thick ivory paper is high quality 8.5"x 11" paper and perfect for framing.